Stand-up comedy is a strange beast and you'll either love it or hate it and Tim Minchin So Live is just one of those discs. Tim Minchin So Live is filmed at the Sydney Opera house Studio in 2007 and features material from Dark Side and So Rock tours. For those who are unaware of Tim Minchin, he has been described as an comedian, actor, composer, songwriter, pianist and huge rock 'n' megastar... well, according to his website anyway but he has been on TV for quite some time. This compilation features sketches about almost everything wrong and overdone in the world that is laced with Minchin's quirky humour and assists in portraying a variety of real-world topics. 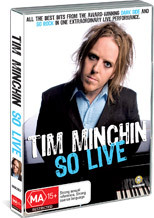 Needless to say, Minchin is a genius on the stage and this DVD will leave you amused from the moment you push play. Melbourne International Comedy Festival Gala 2006 performance - "Canvas Bags"
Melbourne International Comedy Festival Gala 2006 performance - "The Guilt Song"
Spicks and Specks 2006 TV performances - "Song for Alan Brough"
Spicks and Specks 2007 TV performances - - "The Adam Hillsong"
The Sideshow 2007 TV performances - "Not Perfect"
BBC Comedy Shuffle 2007 TV performance - "Canvas Bags"